My current best game right now is Para Para Dancing or Para Para Paradise depending on version. 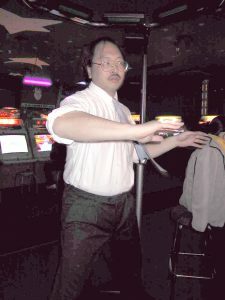 This is a hand dancing game like Dance Dance Revolution except it is a lot less hard on my body.Of course, I love this game because this IS a game I am good at and a game I love to play because it will draw an audience to watch me play! !My personal bests on a Para Para Paradise (Korean version) is Dynamite Rave on Expert with High speed and soft on. This is one of the two hardest songs in the game. I can also get near perfect on Boom Boom Fire which one of four seven star songs in Expert mode with high speed and soft on. I have only once cleared Boom Boom Fire with high speed, soft and random turned on.On Para Para Dancing 2, I can also do, Deluxe (6), Burning Desire (6), and Money Go (6) almost perfectly on hard with high speed on. 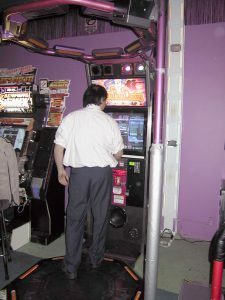 The hardest songs in the game are 7’s they are Boom Boom Fire, Tora Tora Tora and Velfarre 2000, and Ultra High Heels. 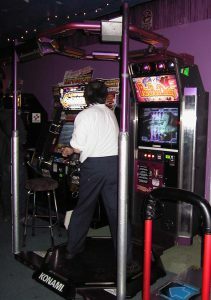 I can do Boom Boom Fire, and I have so far done two of these three, I still am working on completing Velfarre 2000 with a positive score above 75%….I love to play at UBC, Parker Place 2 and Space Rush, and Metrotown. I love playing at Rush because the girls look at me amazed at anyone who can do that game at that complexity, and of course their boyfriends are just outclassed by a game their girl friends can beat them at. I also like playing at Metrotown because that does draw a crowd from the more common people from the food fair. 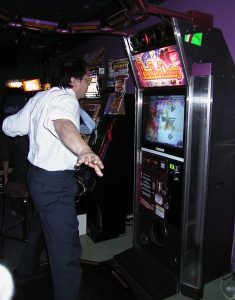 They always look so amazed.As of Feburary 2002, I only know of 12 initials on the high score boards that can even play the game to my skill. I know 4 of them, they are customers of my anime store.